Technology has without doubt impacted all aspects of our lives today. Every other day we get to hear of a new innovation aimed at enhancing our experiences and making life easier. In the recent years, one of the key buzzwords in the technological corridors has been the voice control which is transforming the entire Internet of Things (IoT) ecosystem. With the concept of connected homes on the rise and people increasingly adopting smart home devices, IoT voice control is being foreseen to gain healthy traction in the coming years in India. 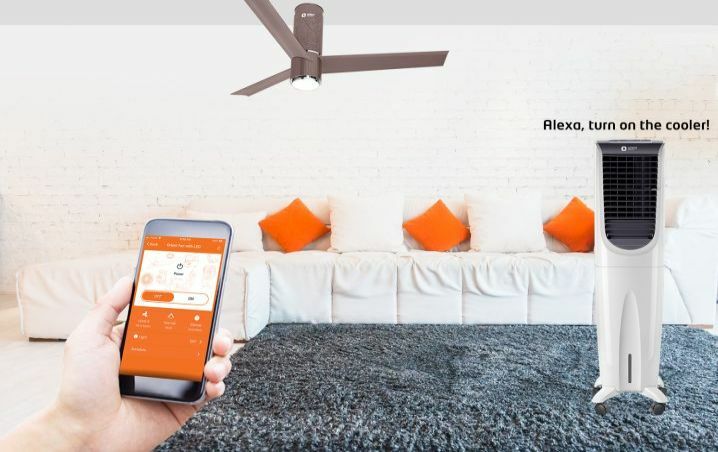 The concept of a smart home which was initially limited to controlling light bulbs with a smartphone has come a long way to include a range of smart home devices which can be controlled with a mobile app or voice assistants like Alexa and Google Assistant. Such is the adoption of smart home devices, that even the most common household appliances including fans and air coolers have gone smart. Much like you would ask out Alexa to play your favourite music or get news updates, you can control you fan or cooler with voice commands. Isn’t that convenient? Some of the key factors driving this shift to smart home devices are rising disposable incomes, increasing awareness about energy efficiency and the appetite within Indian consumers for aspirational lifestyle. So, what is IoT and how voice control is making this phenomenon even bigger? To put it simply, IoT is a network of internet-connected physical devices that can collect and exchange data. These smart devices, embedded with electronics, software, sensors and connectivity, can communicate and interact with others over the Internet while also offering the convenience of remote monitoring and control. For example, if you left your IoT-enabled fan, cooler or some other appliance running at home by chance, you have the power to turn it off from the comfort of your car or office. Now that saves you both time and money, not to mention the expediency and peace of mind. Taking another example, you are getting back to home on a hot summer day after a hectic day at work and want to be greeted to a chilled room, you can simply turn on your air cooler and set the desired speed. So, before you even enter your home, it’s ready to cool you. The increasing acceptance of voice assists clearly indicates that voice control is set to become the next big thing in smart home technology. As more home devices become connected and voice becomes more human and context conscious, voice control will unfold the next chapter in the evolution of human-machine interaction and will emerge as a game changer in the segment. We at Orient had been watching this space closely and lately, we have introduced India’s first IoT-enabled fan Aeroslim and a complete range of IoT-enabled desert, tower and outdoor air coolers. With our IoT-enabled fan and coolers, one can manage speed, modes, timer, lighting and much more via Orient Smart mobile application available on both Google Play and Apple App Store. To top it all, these products are compatible with Alexa and Google Assistant, which takes convenience to the next level. So, when you don’t feel like getting up from your cozy sofa or open the app, you can simply ask Alexa to control the fan or the cooler. Also, these products are a great option for people with limited mobility owing to old age or physical disability. So, what are you waiting for? Bring home one of our IoT-enabled air coolers or the IoT-enabled Aeroslim fan and make this summer conveniently comfortable.